For the launch of the new AT&T, PlayMotion! 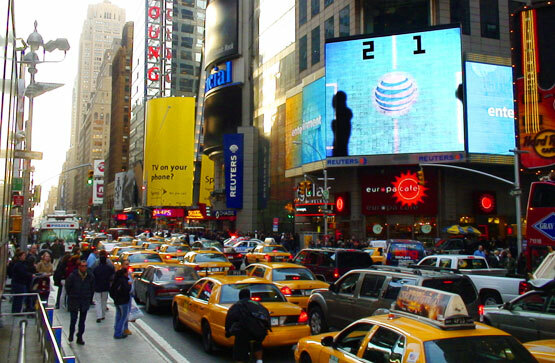 was selected to transform the canned content of the largest LED sign in Times Square into a real-time interactive playground for the estimated 1.2 million people swarming the streets during New Year's Eve 2006. In an interactive trilogy kicking off on New Years Eve and continuing through the month of January, PlayMotion unleashed a series of interactive events culminating in "the World's Largest Human-Active Videogame." 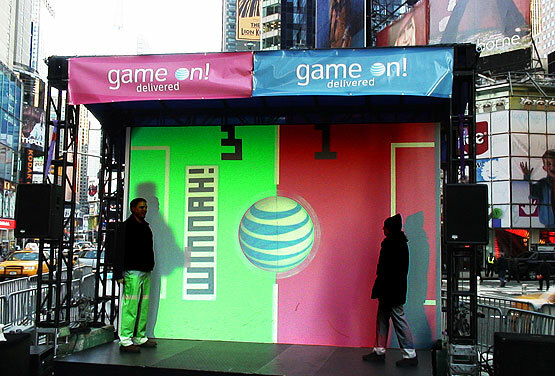 The first gift to the people was an interactive piece dubbed "Your Fame Delivered", designed to coincide with the massive "Your World Delivered" campaign announcing the new AT&T. 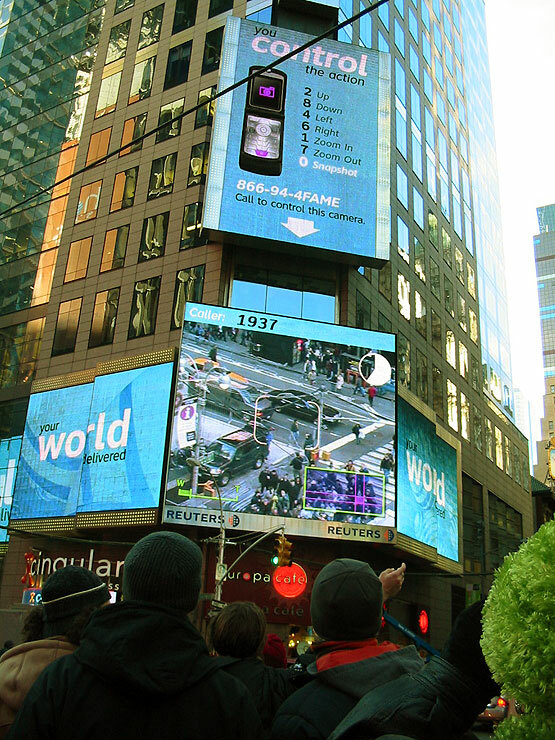 Using their cellphones as remote controls, one person at a time was given complete control over a fully robotic HD camera which they could use to pan, tilt and zoom all over Times Square... and, with PlayMotion's augmented reality interface, use to find and frame themselves on the massive 30' x 40' LED screen in the heart of Times Square, for over one million bystanders to see bright and clear. PlayMotion in the heart of Times Square, New Years Eve 2006 Once they were in view, participants could take a snapshot with a simple button push, which automatically sent the photo to a private web address. As the shutter snapped on the big screen, simultaneously a text message was sent to the participants phone, telling them the secret web address where they could pick up their once in a lifetime souvenir. The PlayCamera was accessed by thousands of people over the course of the run, and kept phone lines backlogged for its entire run. In the second installment, pedestrians were encouraged to dial a toll-free number to have the "All Seeing Orb" determine if they would keep their New Years Resolution -- and get a little public air time in the process. Callers were asked to state their resolution verbally in a phone call to the Magic Orb. Operators standing by keyed the resolutions into the PlayMotion LiveServer. Resolutions were then displayed in a real time text stream to the massive LED surface, whereupon a "Magic 8 Ball" put up such humorous predictions as "Yes, of course... NOT." As the grand finale, to reinforce the gift of play, AT&T next sponsored a full "day of play" street event in the middle of Times Square, where particpants could perform and compete on an open stage with select branded PlayMotion experiences. Heralded as the World's Largest Human-Active Videogame, participants (and thousands of passers-by) were able to insert themselves into virtual competitions of Volleyball and Human Pong, displayed at massive scale up on the Reuters Sign. The icing on the cake was that each player was granted their moment of fame as their name or message was writ large in lights, just above the active gamescreen, hundreds of feet above the teeming pedestrians and cars of New York City. 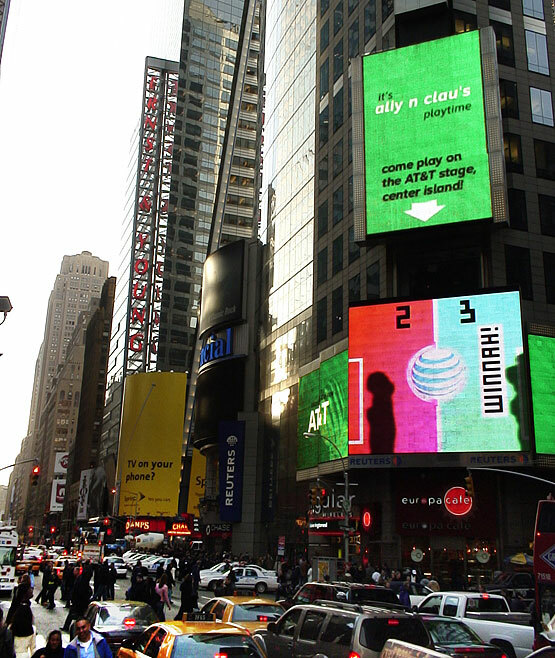 AT&T's PlayMotion on Times Square project was conceptualized, designed and programmed by PlayMotion on behalf of GSD&M, with the creative backing of SuperFAD and the technical assistance of Instinet/The Reuters Sign crew. 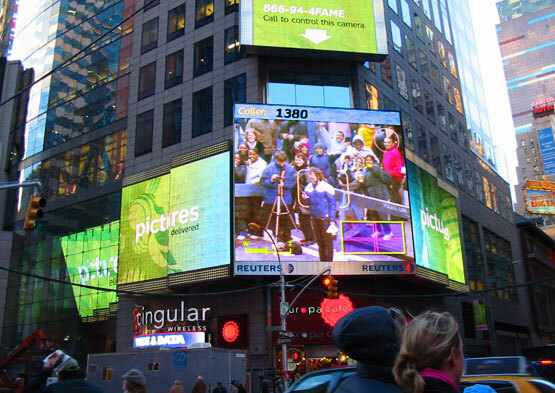 PlayMotion Live in Times Square, 40 feet tall. The action on the ground, center island, echoes up to the big screen in real time. You control the camera, and the image, for AT&T and one million streetside viewers! A participant zooms in close with 15 minutes of Fame. PlayMotion in the Control Room, Reuters Sign.